"A soft vanilla custard with floating clouds of poached meringue." Watch how to make this top-rated Creme Brulee. I've been looking for this recipe for years. It was a family tradition at Christmas. We called them "snowballs". Nice and light dessert. I made this for a friend who had fond childhood memories of this dessert. She was very pleased and I have already made it again because I enjoyed it as well. 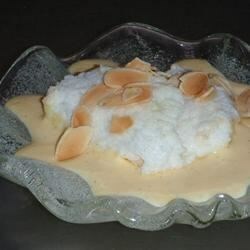 This is very similar to a recipe my grandmother used to make in the 60's which was from the Better Homes and Garden cookbook called Susan's Snow Pudding. Very good and easy. so good and worth the effort. HUNGARIAN FLOATING ISLANDS – MADÁRTEJ This is what my dad remembered as when he was young. I used a torch to brown the meringue. I have been using powdered egg whites for my baked Alaska and floating islands.